Wimmer has a boyish look and a constant chuckle, perhaps belying his daily juggling ofmillionsof dollars for many years, first on WallStreet while working for Goldman Sachs, and now at his own bank. But in between office duties, he has traveled to 66 countries, skied at the world's highest ski resort — on Chacaltaya mountain in Bolivia at nearly 18,000 feet (5,500 meters) — and even made the first-ever tandem skydive over Mount Everest, the highest point on Earth. So going to space seems to be a natural next step. 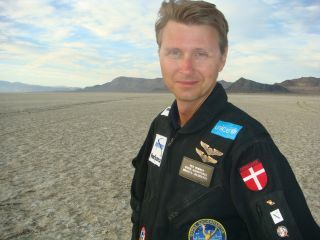 Danish entrepreneur and financier Per Wimmer poses with the founder of Virgin Galactic, Sir Richard Branson. Despite being among the first customers who secured his place with Space Adventures, Wimmer said he preferred not to rush and "to hedge my bets on who were to come first with a viable rocket.” But it didn't prevent him from starting to get ready for the trip, along with other space tourists who blasted off before him. First, he arrived at the Yuri Gagarin Cosmonaut Training Centre in Star City, on the outskirts of Moscow. There, he had to climb inside a nozzlelike structure — the world's biggest and most powerful centrifuge, made to simulate space flight. As the centrifuge spun at breakneck speed, the future space tourist was subjected to several times the g-force on Earth. The g-force is the acceleration due to the Earth's gravity under freefall. The higher the speed, the greater the g-force experienced, and the more pressure, or tugging, felt inside the body. Astronauts, fighter jet pilots and racing drivers all feel considerable g-forces. A year later, in 2006, XCOR Aerospace contacted Wimmer as well and offered him a chance to be the first astronaut to fly on their Lynx spacecraft, once it's ready to take to the sky. This ticket cost him $95,000.